I love so many things about this weeknight dinner, consisting of Butternut Squash, Brussels Sprouts, and Smoked Turkey Sausage. Sometimes the best meals are the simplest! 1. Inexpensive – This meal fed two for under $7, or so. 3. Easy – I am convinced that roasting is the easiest and most delicious way to prepare so many veggies (such as kale yesterday!). 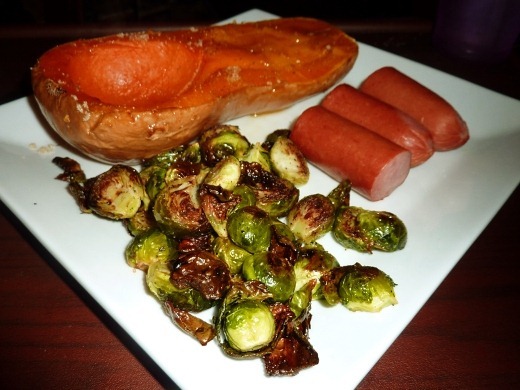 I roasted the butternut squash for about 50 minutes, and the Brussels Sprouts (tossed in EVOO, salt, pepper) for 30 minutes, both at 400 F. The Smoked Turkey Sausage (I refer to it as “kielbasa”) I simply broiled in my toaster oven. Butternut Squash is one of my favorite things; I was scraping the peel clean of every last squashy morsel. Mmm mmm!!! And if you don’t think you like Brussels Sprouts (as I thought for 24 years, until last year), I challenge you to try roasting them. Speaking of “low-calorie,” I updated my “Calorie Counting” page today. Click HERE or click the Calorie Counting tab at the top of the page to see. Currently listening to: Telling Ghosts – Puscifer. There are SO many songs on the radio lately just I just CANNOT stand. Yes, I am talking about you Moves Like Jagger, Pumped Up Kicks, Adele remixes (wthell!? why!? so unnecessary), that “la la la la laaa” song. Ugh! You should! They’re really good! I love roasted Brussels sprouts but have never roasted butternut squash. That looks yum! How did you season it? I think I’m going to roast cabbage tonight instead of boiling it like I have in the past. Mmm, roasting! Roasted Brussels Sprouts are so good! For butternut squash, I brush the exterior with olive oil, and generously season with salt and pepper. During the last 10 minutes of roasting, I sprinkled a few teaspoons of brown sugar on top, and it caramelizes and gets so delicious! I wait until the last 10 minutes or so to add it, to prevent it from melting TOO much, all over the bottom of the baking dish. Good luck! Pingback: Garlic Roasted Salmon & Brussels Sprouts « Meg.Goes.Nom.Nom.